Give away this branded CalendarPod Midi Duo and you will have a popular promotional item on your hands. 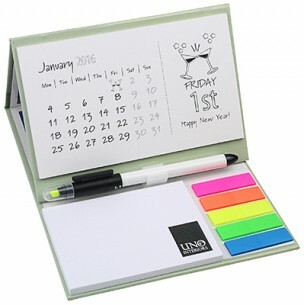 The standalone calendar presents one month to view, and it also comes with an A7 pad containing 50 sticky notes and five coloured index tabs containing 25 sticky notes in each. It even comes with a pen included, which doubles up as a highlighter. Best of all, it won't take up much space on the desk. Your branding is printed via digital or litho printing.